Please note that the dates for the rest of our programme have now been updated. We will be running a Sue Booth workshop on October 18th 2018. Please let Sheila know if you are interested in attending either of these so we have an idea of numbers and costs. We are hoping to exhibit at the Big Textile show once again this year. 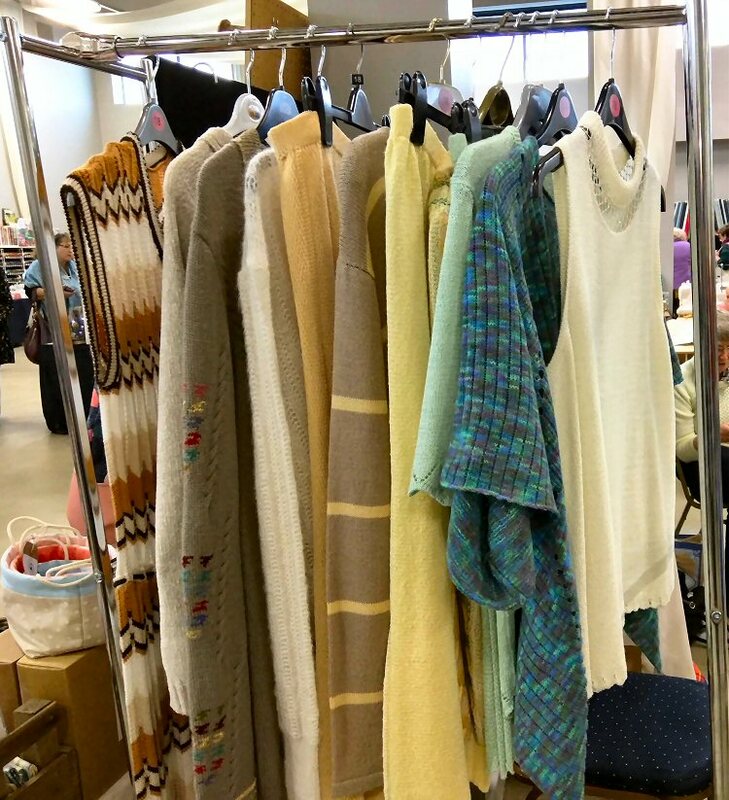 If you have garments you'd like to exhibit, please pass them onto either Bob or Sue. Bob will be doing a demonstration of machine knitting at Cossington library; the idea is that others will demonstrate at their local library in order to spread the word about machine knitting. Sheila would like deposits for the Christmas meal so she can confirm the booking. Please contact her directly ASAP. We had a stand at this year's Big Textile show, held at the Leicester racecouse in Oadby. 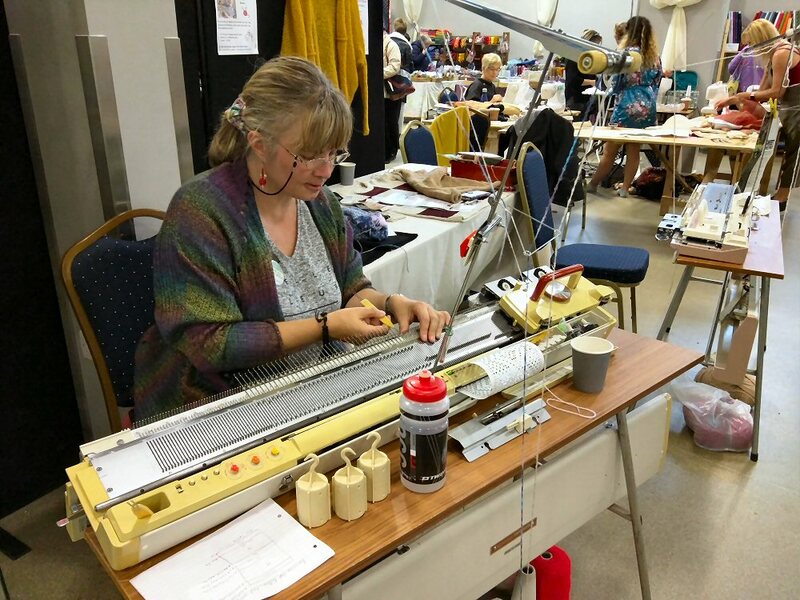 We had lots of interest from both old and new machine knitters, and hopefully inspired a few people to either get their machines out from under the bed, or get them moved on to younger folks. 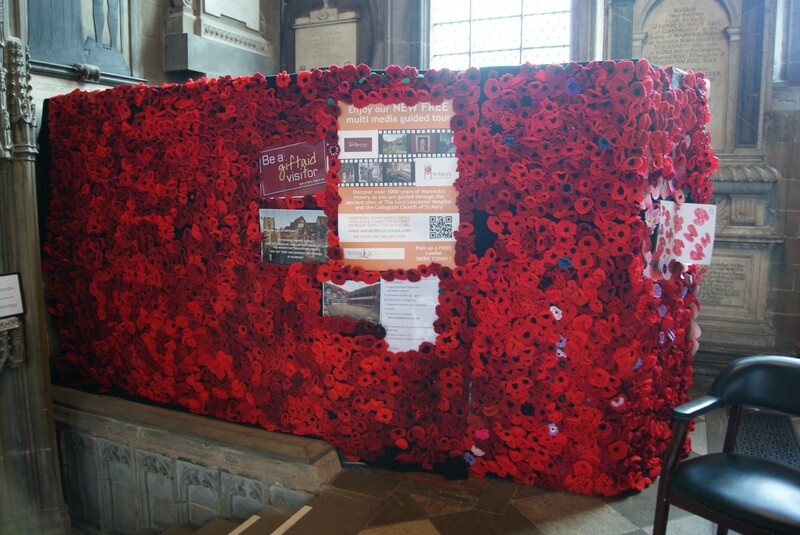 We knitted about 64 poppies for the WW1 Centenary display at St Mary's Church in Warwick. 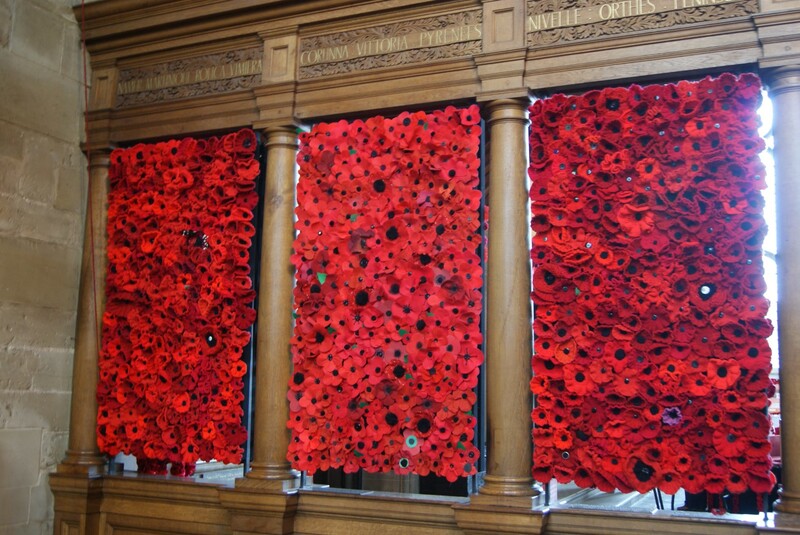 Jane went to take a look in November and there were thousands of them, a beautifully breathtaking tribute to the fallen. No, she couldn't spot any machine knitted ones but there were far too many to count! Barbara showed us a lovely way to create a folded buttonband, complete with finished holes. Reminder, the next Weds meeting (20th) we will be knitting Sue's pouch using this technique. There will also be a committee meeting. 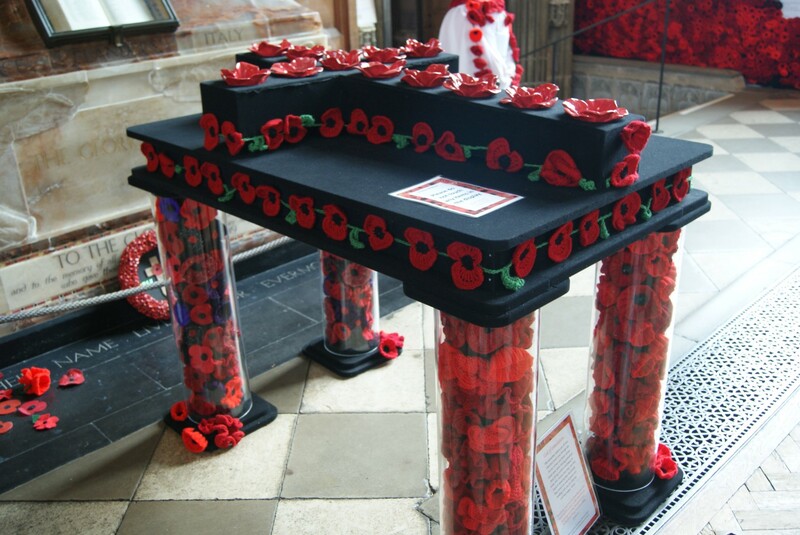 There will be a machine knitting demo at Knit One in Leicester on Tuesday February 19th, 11-3pm. Do pop in and say hi if you can! Long Buckby MK club are running a Monday afternoon event on the 8th April, with Anne Lavene as the speaker. Take a packed lunch from 12.30pm - please contact the club directly if you would like to go so that they have an idea of numbers. Suggested date for the 2019 xmas meal (usual venue) is December 10th - this is a preliminary suggestion to gauge numbers at the moment, so please inform a member of the committee if you would like to attend. There were a large amount of books and small knitting items available for members to choose from, the result of an estate clearance. We were a bit late starting because of various factors, but Sheila and Jane showed us some interesting skirts and then both attempted to demonstrate one of the skirts. The pattern in question was to cast on in full needle rib, then rearranged so that only certain needles remained in work on the ribber, which would produce a "faux rib" effect on one side. Alas, the ribber had other plans, and the demonstration turned into "how to remove three bent needles from the ribber". Alas, no pictures, as no sucessful swatch was produced. It just goes to show, it happens to the best of us! Bob reminded us about next weekend's forthcoming knitting show at West Park Leisure Centre in Wilsthorpe Road, Long Eaton NG10 4AA. It runs 10-4pm and there are two bookable talks (Sue Booth, Erica Thomson). More information is available here. It's not far from Long Eaton station.